Somerset County Deputy Cpl. Eugene Cole (left) was killed in the line of duty during the early morning hours of Wednesday, April 25, 2018, in Norridgewock. John D. Williams (right), 29, of Madison, is the suspect in the fatal shooting. 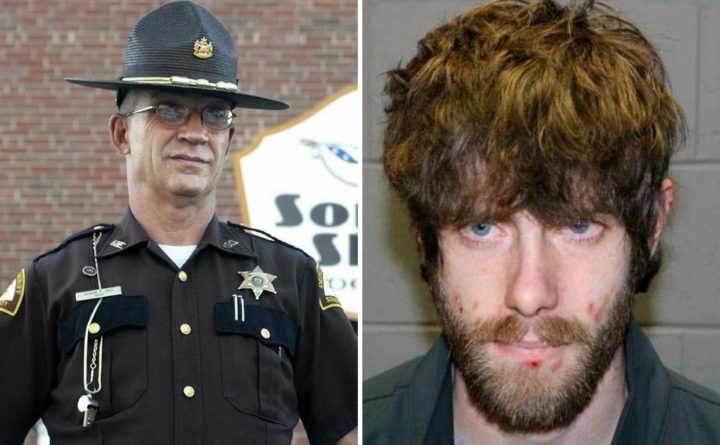 John D. Williams, who allegedly shot and killed Somerset County Sheriff’s Deputy Cpl. Eugene Cole four days ago, was taken into custody without incident just before 1 p.m. Saturday. On Saturday — the fourth and final day of the manhunt — it was still unclear how Cole, 61, and Williams, 29, initially came into contact with one another early Wednesday morning, or what led Williams to shoot him. A friend who said he gave Williams a ride on Tuesday said Williams was distraught, because he was expected to appear in Massachusetts court the following day. Kimberley Sirois told the BDN that she found Cole’s body in her yard at 16 Mercer Road in Norridgewock, approximately five hours after police said he was shot on Wednesday morning. Police said Friday morning they had spoken with members of Williams family, and urged Williams to contact them. They repeated that request during a noon press conference on Saturday, shortly before Williams was apprehended. Police know more about Williams’ actions in the 24 hours before the shooting, said authorities, who did not reveal details. Here’s a timeline of what we know so far about this case. Williams had been scheduled to appear in a Massachusetts court for an initial hearing in an illegal gun case stemming from a March 22 arrest. The gun charge could lead to a sentence of more than 10 years in prison, according to a spokeswoman for the Essex County district attorney’s office and court documents. Between 1 a.m. and 2 a.m. Somerset County Sheriff’s Deputy Eugene Cole is shot and killed, but police have not yet confirmed where, geographically, the shooting took place. Police have provided no facts detailing the circumstances of the encounter, including where Cole was shot. After Williams allegedly shoots Cole, he steals his fully marked police cruiser and drives it to the Cumberland Farms convenience store at the intersection of Main Street, Mechanic Street and U.S. Route 2. Williams robs the store, according to police, and flees in Cole’s cruiser. At some point after that, Williams drives south. Less than a half-mile away, Mechanic Street splits into Smithfield Road and Martin Stream Road. The latter is a long, rural road that eventually becomes gravel, as it snakes alongside train tracks. About three hours later, Cole’s vehicle is found on Martin Stream Road. 1:41 a.m. The police cruiser dashcam footage shows Williams entering the convenience store in Norridgewock. 1:42 a.m. Williams exits the convenience store. Around 1:42 a.m. Somerset County sheriff’s deputies respond to a report of a robbery at the Cumberland Farms convenience store. 3:30 a.m. Waterville Road, Norridgewock: Resident Cassie Allen wakes up to the sound of sirens. 5 a.m. Cole’s abandoned cruiser is found on Martin Stream Road in Norridgewock. 7:15 a.m. Kimberley Sirois finds Cole’s body on her lawn at 16 Mercer Road, which is also U.S. Route 2, in Norridgewock, just down the street from Mill Stream Elementary School, where Sirois works as an ed tech. Law enforcement officers descend on the area. Just before 10 a.m. Somerset County Sheriff Dale Lancaster announces that a nationwide manhunt has been launched to find the suspect, John D. Williams, 29, who is believed to have fled the vehicle on Martin Stream Road on foot. Williams is described as 5 feet 6 inches tall, 120 pounds with brown hair and blue eyes. Police set up a central command center at the Norridgewock Fire Department on Upper Main Street. Around 11 a.m. Law enforcement officers place Cole’s body on a stretcher and into a Maine State Police evidence van. 11:17 a.m. The state police vehicle carrying Cole’s body is seen driving through downtown Norridgewock en route to the state crime lab in Augusta for an autopsy. 11:30 a.m. About 8 miles away, police barricade Jones Street in Madison, believing Williams might be inside 16 Jones St., which is his last known residence. Police scour Norridgewock and the surrounding area Wednesday afternoon, pursuing leads but coming up empty handed. Spectators gather in the rain at the western end of Jones Street, watching police form a perimeter around the blue, two-story house with weapons drawn. The perimeter trapped other Jones Street residents inside, many of whom are unaware of what is taking place until they look out their windows or receive calls from loved ones. Just after 7:30 p.m. Maine State Police approach 16 Jones St. in an armored vehicle, and announce over a loudspeaker that they have a warrant. They demand that those inside the house come outside with nothing in their hands. If they cannot do that, police command anyone inside to call 911 and ask for Maine State Police, or turn on a light or rattle a curtain to notify police they are inside. Things will end safely if instructions are followed, police say. “We want to hear your side of the story, we want to help you,” State Police announce over speaker in front of 16 Jones St.
Closer to 8 p.m. Using the armored vehicle with a mounted battering ram, police knock down the front door of Williams’ last known residence on Jones Street, but do not find Williams. “I saw them take out the porch and ram the door, just to open it up so they can gain entrance,” said Christopher Cowin, who lives at 6 Jones St.
Cowin said he saw four officers storm inside. “I didn’t see any civilians come out,” Cowin said. Around 9:30 p.m. Marooned residents of Jones Street are allowed back in their homes. Wednesday evening, Cole’s body is transported to Smart & Edwards Funeral Home, at 183 Madison Ave. in Skowhegan. Bagpipes play and law enforcement officers stand shoulder to shoulder along the roadway as his body arrives, according to an employee of a motel across the street from the funeral home. I just had the opportunity to witness a scene I hope to never see again in my lifetime. May you rest in peace Corporal Eugene Cole. 9 a.m. Williams remains at large, but Sheriff Lancaster says, “We do have some belief that he might still be in the area,” during a media conference. “Today we continue to have a large contingency of county, state, local and federal law enforcement dedicate to capture of John Williams,” Lancaster says. Police have had no contact with Williams, “but we believe he is still armed and dangerous,” he says. “I’m asking John Williams personally, if you are listening to my words today, I implore you to turn yourself in,” Lancaster says. Just after 10:30 a.m. Media outlets report that police are staked out along Bear Mountain Road, just over the Norridgewock town line, in Fairfield. Bear Mountain Road intersects with Martin Stream Road, about 5.5 miles south of the convenience store that Williams robbed. 11:20a.m. State police urge everyone to stay away from Bear Mountain Road. Police continue scouring the surrounding area throughout the day on Thursday, and eventually thin their presence at Bear Mountain Road. 4:55 p.m. Local and federal law enforcement agencies announce a reward of up to $20,000 for anyone able to provide information that will lead to Williams’ arrest. Anyone with helpful tips is asked to call (207) 624-7076 or submit a tip electronically, at tips.fbi.gov. 5 p.m. Williams is still at large as the sun begins going down on the second day of searching. Police maintain a heavy presence in the area throughout the night on Wednesday and into Thursday. Law enforcement officials set up overnight roadblocks in the Norridgewock area and hand out wanted posters to passing drivers. 9 a.m. Police focus their efforts on searching the wooded area around Martin Stream Road. Officers continue knocking on doors and talking to residents. Police confirm they have been in touch with Williams’ family and can account for his whereabouts in the 24 hours leading up to the shooting. They ask anyone who was contacted by Williams after 2:30 a.m. on Wednesday to contact them immediately. 5 p.m. Republican Gov. Paul LePage issues an emergency declaration and suspends hunting in sections of Norridgewock, Skowhegan and Fairfield until further notice, due to the ongoing manhunt. Sheriff Lancaster says law enforcement are continuing to search a 25-square-mile area of woods near Martin Stream Road. 12 p.m. Police continue searching the 25-square-mile wooded area near Martin Stream Road. Wednesday. Cpl. Cole’s widow makes a plea through Sheriff Lancaster for Williams to turn himself in, or at least talk to law enforcement. 12:43 p.m. A seven-person law enforcement team locates Williams outside a camp near Lost Brook. He is arrested — with Cpl. Cole’s handcuffs — less than half a mile from Martin Stream Road in Norridgewock. Over the next few hours, Williams is taken to the Waterville Police Station for questioning before he is transferred to the Maine State Prison in Warren.